Are you beating your brains in trying to secure more cleaning contracts and are tired of spending time and money with nothing to show for it? Don’t worry you’re not alone! Generating Cleaning Contracts Is An Art That Can Quickly Become A Nightmare! That’s because 95% of people who own a cleaning business run into these 3 problems very quickly! They start as a subcontractor servicing contracts that other cleaning companies own leaving thousands of dollars per year on the table, and remain that way forever! They don’t know how to generate cleaning contracts on their own that pay big money every single month! They lack a system that actually turns prospects into customers without ever picking up the phone! In order to operate a successful cleaning business, here is exactly what you need! Contracts that actually pay ON TIME, pay TOP DOLLAR, and come in LIKE CLOCKWORK! This way you can easily staff them, turn a profit from the get go, and move on to the next one! The cleaning industry is so big there is enough business out there for everyone. Yet it seems only the big boys constantly generate contract after contract leaving everyone else to fight over the scraps. And if you think for one second that the big boys are going to share their secrets with you, think again. But with a little research, you’ll quickly find out that their really isn’t a secret. They just run their cleaning business like a well oiled machine, implementing some incredible strategies! And that is the million dollar question? How can you finally copy the big boys and implement your own well oiled machine that generates customer after customer on a tight budget? A proven system you can use to build a cleaning business that grows month after month on Auto-Pilot! In less then 5 minutes you can download our entire Ultimate Cleaning Business Package from our servers right to your computer! If you’re serious about growing your cleaning business, then read what some of our customers around the world had to say about our package. Our Package Works Regardless Of Your Location, Or Type Of Cleaning Business. It Was Designed To Work For Everyone, Everywhere! 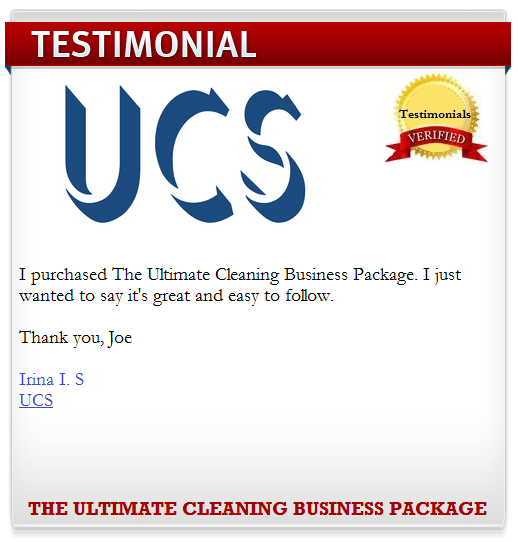 Check Out The Features Of The Ultimate Cleaning Business Package! With a little research you’re quickly going to find all the big boys in your market utilizing the power of video marketing. You’ve probably already seen many of their videos. Believe me video marketing is where it’s at right now! YouTube is the 2nd largest search engine in the world and not tapping into that free traffic is just nuts! This powerful video training series contains 10 video lessons where you will watch us research a highly targeted keyword for our local market that customers use to search, create a stunning video in no time, upload to YouTube, optimize for the search engines, rank the video on the first page of GOOGLE, and then delete the video. We created this video for a company that doesn’t even exist and made up a name and phone number. In less then 1 month the video achieved over 700 views just by ranking on the first page of GOOGLE. 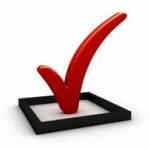 The biggest mistake bar none that most cleaning businesses make is not building a mailing list. It’s insane! Because of this fatal mistake, every year they have to spend thousands of dollars in marketing to keep their cleaning business in front of potential customers. Guess what the big boys do? They build mailing lists because they understand that even if they don’t land a contract from a prospect today, with a little followup on auto-pilot, they’ll get them tomorrow! Now you can watch how the pros do it! Watch these 10 videos where we create a mailing list that grows on it’s own 24 hours per day, seven days per week. We load up the mailing list with pre-written messages designed to go out whenever we want the customer to be followed up. And guess what? The customer has no idea that our email was sent to them automatically while we were out to lunch or in bed sleeping! Talk about automation! Use this method to build a huge mailing list of prospects and you’ll never have to spend money on marketing again. Imagine having a mailing list with potentially thousands of prospects. How many contracts do you think you could land? Simply email your list of prospects whenever you want with a push of a button! 10 audio tutorial lessons that will teach you what separates the companies that consistently secure new clients, from those that don’t. In these tutorials we give you the secrets and techniques on how to grow your cleaning business, how to present your cleaning proposal to your clients, how to get free advertising, secrets on what kinds of people you should talk to that will send you business free of charge, and much much more. You will also learn the single most vital important thing for your business in lesson number 10. If you get this wrong, your business is going to sink faster then the titanic! With this janitorial software package you will also get invoices, purchase orders, business plans, marketing plans, price quotes, & more. Everything in Microsoft Word Templates. Simply add all your Company information and you now have everything you’re going to need on the paper side of your cleaning business. You can invoice your clients, build a business plan to get funds from the bank, and start a marketing campaign that will take your cleaning company to the next level! OUR CLEANING BUSINESS PACKAGE WILL SHOW YOU HOW TO EXPLODE YOUR PROFITS, CRUSH YOUR COMPETITION, AND COMPLETELY DOMINATE YOUR MARKET! As you can see, THE ULTIMATE CLEANING BUSINESS PACKAGE really does work. If you were to purchase every single part of this package separately, it would cost you $1,042.00. THAT’S RIGHT OVER ONE THOUSAND DOLLARS! But Get Full Access To The Ultimate Cleaning Business Package for a ONE-TIME payment of only $497, $297, $97! Only ninety seven dollars if you order right now! IMMEDIATE DOWNLOAD of the product after your payment! Clickbank sells our products – they are a trusted online retailer specializing in digitally delivered products. At the request of our members we have put together 10 short videos showing you all the tools we use to continually rank our websites, videos, build our mailing lists, monitor our traffic, build backlinks, and really dominate any niche we want. Now you can use them too and tell the big boys to go jump in a lake! 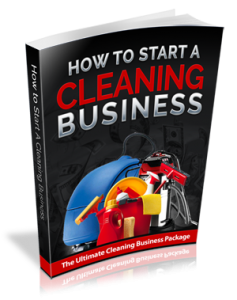 Step-by-step how to start a cleaning business quickly & easily! How to design a professional looking website that will generate hundreds of cleaning quote requests from your company! 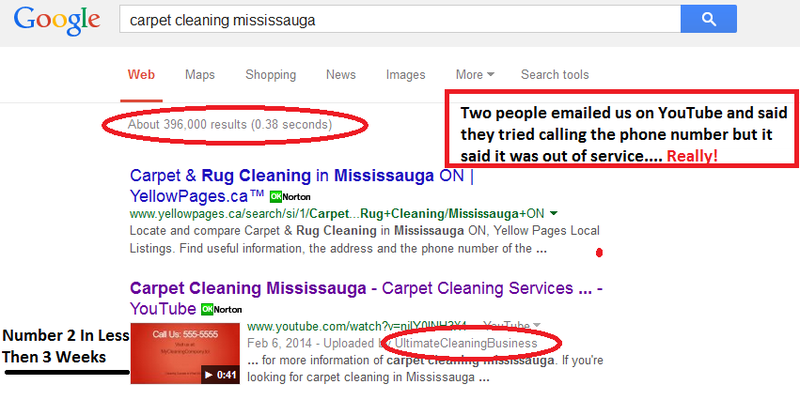 How to do proper keyword research to find local targeted keywords that your customers are using to search when they look for cleaning companies! How to hire your cleaning staff and what contracts they should be signing to protect you from people who are only out there to steal your clients! Why signing contracts with all your clients is important, & what contracts you need signed before you even pick up a mop! The best cleaning resources that will take your cleaning business to the next level! How to set up a referral system that grows your business 24/7 without you ever lifting a finger! How to maximize your advertising & marketing campaigns to obtain more cleaning contracts! 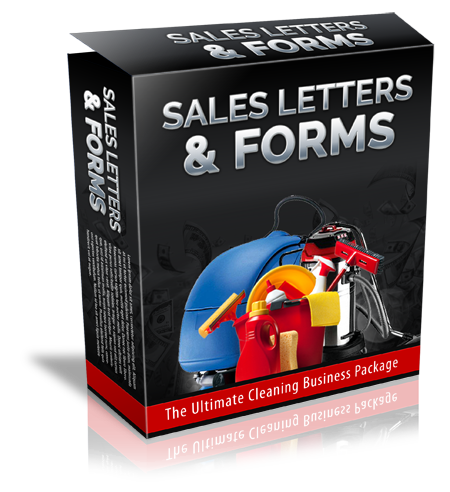 With these 10 sales letters and forms, it will make running your cleaning & janitorial business a breeze. Constantly updating these forms so all you have to do is just keep checking back for more. Use the forms to protect your business legally, and to keep your operation running smoothly! Here are a few of the ready-to-use letters/forms in the library! Our cleaning business package is guaranteed to give you an UNFAIR advantage over your competition. Learn how to start a cleaning business quickly, easily, and make money from day one! Where & how to advertise your cleaning business with little or no money down and get the best results! How to use video marketing to dominate your market and generate thousands of website visitors every month that turn into customers! 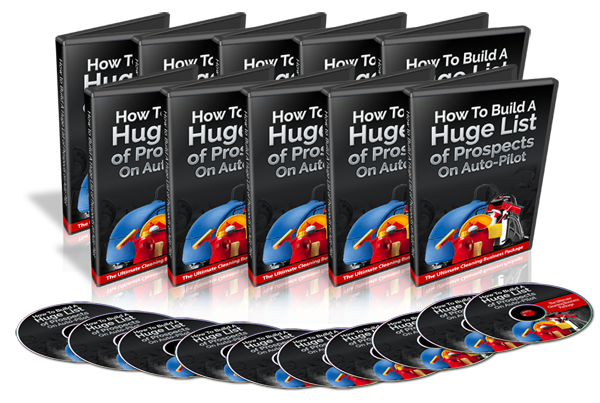 How to build a mailing list on auto-pilot that continues to grow long after you have stopped paying attention to it! How to hire appointment setters that won’t cost you a dime until they actually get you clients! Step by step instructions on registering, licensing, & insuring your business! How to hire commission sales people who will only get paid when you get paid, and how much you should pay them! How to implement a referral system that generates new hot leads for your cleaning business everyday! Where to find potential hot leads that are ready to turn into customers for free! And insanely, this is just the beginning! Here read some more testimonials from satisfied customers around the world! We’re not just going to make a bunch of crazy claims and promises, we will back it up with a 100% 60 day money back guarantee. 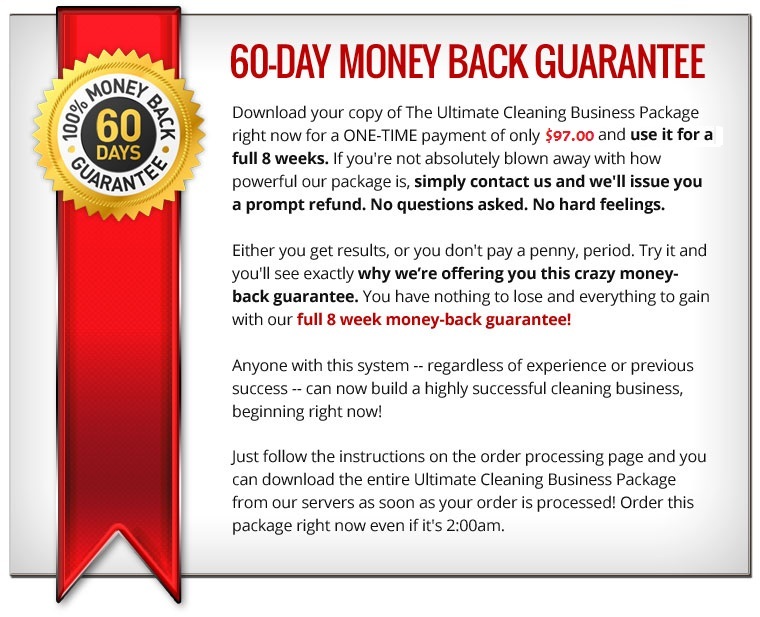 We’re going to do this because we are so confident that once you get your hands on The Ultimate Cleaning Business Package we won’t be able to buy it back from you, let alone get you to simply give it up! Just follow the instructions on the order processing page and you can download the entire Ultimate Cleaning Business Package from our servers as soon as your order is processed! Our package is available for purchase WORLDWIDE 24 hours per day, 7 days per week. I understand that I will be gaining access to all the contents of the Ultimate Cleaning Business Package instantly after my payment has been made. I understand that this is a one-time fee only and I will never be billed again for this incredible package. You’ll receive instant access to your package, even if it’s 2 am in the morning. P.S. Starting a janitorial business is one the easiest and most profitable businesses available on the market today. But what most other packages & eBooks don’t teach you is how to gain long term success and that is exactly what you’ll learn with everything in THE ULTIMATE CLEANING BUSINESS PACKAGE! P.P.S. Are you still here? 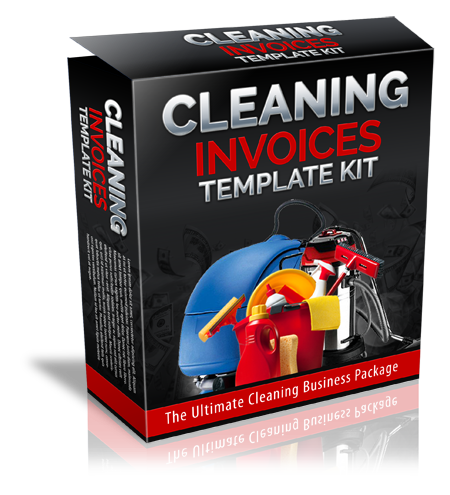 Don’t you realize that the sooner you get your hands on THE ULTIMATE CLEANING BUSINESS PACKAGE the sooner you can get insider secrets to explode your profits! I think you’ll agree, a big income that you are in complete control of is worth a mere $97 bucks! Copyright © 2019 Ultimate Cleaning Business Package. All rights reserved!